Aberdeen 1, Hibs 2. SPL. Saturday, October 4, 2008. Derek Riordan’s double gave Hibs victory at Pittodrie as ten-man Aberdeen lost for a fifth consecutive match, while the Easter Road men moved up to fourth in the top flight. The home side enjoyed the bulk of possession early on and carved out a good chance on the quarter-hour mark when Richard Foster’s shot was palmed away by Yves Ma-Kalambay. Four minutes later, Hibs’ strikers combined well, Steven Fletcher’s reverse pass creating a shooting chance for Colin Nish, which the former Kilmarnock forward fired wide. Darren Mackie then drew a save from Ma-Kalambay with a volley from Lee Miller’s knockdown before the Hibs goalkeeper was called upon again to deny the Dons when Miller struck powerfully from the edge of the penalty area. Hibs opened the scoring just after the half hour when Lee Mair’s short passback to Jamie Langfield was intercepted by Riordan and the former Celtic striker rounded the goalkeeper before rolling into the net. Within seconds of that setback, Aberdeen captain Scott Severin found space inside the penalty area and tried to bend a shot past Ma-Kalambay but the Belgian keeper continued to frustrate the hosts with another block. Fletcher then missed an excellent chance to double Hibs’ lead when he blazed over after being found by John Rankin’s pass. The Dons equalised in the 41st-minute though, when referee Mike McCurry penalised Sol Bamba’s challenge on Miller, who took the responsibility himself and fired the penalty confidently past Ma-Kalambay. The home side continued to apply pressure at the start of the second half with Miller, Sone Aluko and Charlie Mulgrew all having efforts at goal. With 22 minutes remaining, Foster forced his way past the Hibs defence but Ma-Kalambay dived bravely to claim the ball on the deck. Hibs came close to regaining the lead when John Rankin’s cross found Nish at the back post, but the striker’s header crept wide. Moments later, substitute Dean Shiels sent Nish through on goal and, after Langfield had saved the shot, Rankin’s rebound effort was flicked towards goal by Fletcher, who looked to be offside. 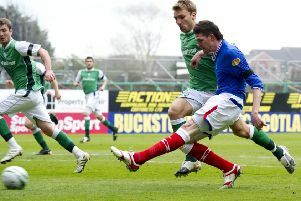 Mulgrew used a hand to block the ball on the line, referee McCurry pointed to the spot for a second time and showed the Aberdeen player a straight red card. The Dons players protested at the spot-kick award, claiming the flag should have been raised for an earlier offside, and Mair was booked. Riordan stepped up and sent Langfield the wrong way with a composed finish. Fletcher fizzed a shot wide as Hibs went in search of a third and Aberdeen were unable to create a meaningful chance in the closing stages. Aberdeen: J Langfield, J Hodgkiss (D Young, 76), L Mair, Z Diamond, C Mulgrew, R Foster, M Kerr, S Severin, S Aluko, D Mackie (C Maguire, 66), L Mille. Subs not used: A Considine, B Bossu, G McDonald, T Wright, S Duff. Hibs: Y Makaba-Makalamby, D van Zanten, S Bamba, R Jones, I Murray, J Rankin, S Thicot (D Shiels, 74), L Stevenson, S Fletcher, C Nish, D Riordan. Subs not used: R Chisholm, A McNeil, S Pinau, R Yantorno, J Keenan, P Hanlon.